The Design Build exhibition is being held at the spectacular new Darling Harbour Convention Centre for the first time this year. It is really worth visiting out this lovely new facility and while you are there pay a visit to the Landscape Tanks stand and check out all the amazing things people are doing with their Landscape Tanks. We are also launching our New OSD system at the show. This system is so novel it means you many not even need a traditional OSD system at all for big savings when building or renovating. 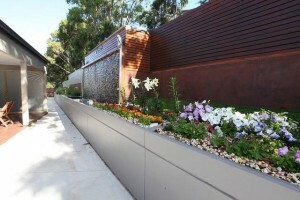 Lovely designer water tanks also acting as a structural retaining wall and OSD system combined.